Streaming boxes are the future of television; there's no point arguing it. The question is, who's going to own it? Until now it's largely been a two-horse race between Apple TV and Roku. But with Walmart throwing its retail weight behind the scrappy little Boxee TV, this rumble just got a lot more interesting. Bloomberg reports the move, which will put the $100 upstart streamer in more than 3,000 Walmart locations just in time for holiday splurging. Its trump card? It can stream live broadcast TV in addition to Hulu Plus, Netflix, and all the other apps you're used to from the main contenders. 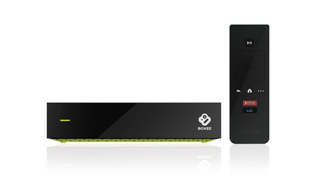 You can DVR an unlimited amount of content that Boxee stashes conveniently in the cloud for you.